There were record levels of drought across almost 12% of the United States in July, says the National Drought Mitigation Center. (CNN) -- Exceptional drought conditions spread across nearly 12% of the United States last month, a record number that shows the widespread impact of the dry weather conditions, according to a report released Monday. Officials at the National Drought Mitigation Center said the July percentage is the highest recorded level of drought since the monitor began documenting conditions 12 years ago. More than 40% of states faced abnormal dryness or drought, a report released by the center said. The report tracks and ranks weather conditions from "abnormal dryness" to "exceptional drought." 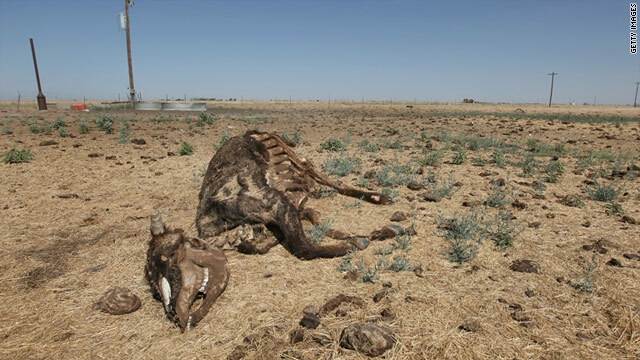 A drought is considered "exceptional" when the situation extends beyond what "could be considered part of normal risk management," according to the center's website. Dry weather has been pervasive throughout the South but particularly difficult for Texas, which hoped to find relief in Tropical Storm Don. The storm made landfall Friday between Corpus Christi and Brownsville but quickly fizzled into a tropical depression, disappointing residents looking for a break. "We were desperately hoping for some rain that didn't come," said Tiffany Sunday, a resident of the Corpus Christi area. Texas is suffering from the third-worst drought in the state's history, according to state Agriculture Commissioner Todd Staples. More than 2 million acres of Texas farmland have been abandoned due to the exceptional dryness, Staples said last week. He added that the weather has been "excruciatingly painful" for producers and affected the harvest of cotton, corn and grain throughout the state. Seven other states are at least 85% abnormally dry. They are New Mexico, Louisiana, Oklahoma, South Carolina, Georgia, Arkansas and Florida. The drought monitor said affected states may see improvement from rain in the coming weeks. "Whenever there is a lot of moisture in a short period of time, the potential exists for rapid improvement. ... But while that possibility exists, it won't necessarily mean the end of drought in those areas," said Brian Fuchs, a climatologist at the National Drought Mitigation Center. CNN's Chelsea Bailey and Gustavo Valdes contributed to this report.